Long ago I had a book of fairy tales, much read, worn and much loved. I don’t know what happened to it, lost in a move, put in a box and never retrieved perhaps. I couldn’t tell you anymore the tales that lay therein, except for one by which I was so struck that I read it more than the others, read it until it was imprinted on my heart and mind. This was the tale of Baba Yaga, and I think it was then, between the covers of that red cloth-bound book that my Russian love affair began. Something of the Baba Yaga’s tale- that old wild hag, flying in her cauldron, living in her chicken-legged house, spoke to something deep in me. Many years later, I would find out that the other half (the half that wasn’t Irish) of my family originated in Russia, and stopped in Austria for a few generations before making their way to America. I grew up during the latter stages of the Cold War. In every Hollywood movie in those days, the Russians were the villains. Communism was the great evil that threatened all our lives, I even had a gym teacher who spurred us on by telling us the Russians were watching us, judging our weaknesses, assessing our flaws. I kind of liked the idea of it. To me, Russia and her people were exotic, foreign, unpredictable. I remember the first time I saw Mikhail Baryshnikov dance, or heard the news of his defection, or saw pictures of Nureyev—was there ever a more Russian looking man than Nureyev with those Tatar cheekbones and haughty air? Russians seemed to hold some terrible ancient secret within them, you could see it in their eyes, something ineffably tragic. I was in my teens by then, and it was all terribly Romantic. In college I took Russian Literature, and I fell in love with a whole other aspect of that great and terrible mistress. I reveled in the pages, thick 19th Century novels when authors wrote books that were elegantly paced and broadly canvassed. I imagined myself into the pages of Anna Karenina– the balls, the gowns, the gently steaming samovars, the manners, the rules and the breaking of those rules by one woman. I sweated out my guilt with Raskolnikov in Crime and Punishment, in my college studio apartment where the taps dripped endlessly. I whispered the names out loud from those books, those of both place and people, for Russian names have always been a deep, rich perfume to my tongue. I ached with Zhivago and Lara in their ice palace, years later, and realized that if you prefer a happy ending with your books, you don’t look for it in Russian literature. Russia—the very name was a dark, rich perfume upon his tongue. He had never been able to bring himself to call this country by its official name of the Union of Soviet Socialist Republics. No, she was Russia, indomitable and cruel, much like the nature of her own people. She was mysterious, dark, and unfathomable: from the far west where the city of St. Petersburg still hung like a sugar-spun fairytale of European architecture, European manners and European decay, a city of water, stone and sky, Russia’s own Venice; to the east, Kiev, its outlines laid down in white marble and etched upon the skies in airy domes, so beautifully constructed they seemed like teacups awaiting the discerning tongues of angels on high to drink their exotic depths. When I began the third book of my Irish series, I didn’t realize that I was about to steep myself in Russia for years, with every aspect of her history that I could get my hands on, with every book about modern Russia—Russia since the fall of Communism, Russia as the new Wild West, where there are no rules by which to guide oneself, a Russia that was no longer a great power. But still she was Russia, indomitable, mysterious, alluring, and as harsh a mistress as any man might fear to have. During this time I also discovered Russian folk tales in all their richness, and shall I say, bloody-ness. He knew the old Russian tales and understood quite well the Russian need for blood and bones and caves and cold dark forests, for bears that governed great iced lands and deformed old women with spiteful wisdom gnawing at their gaunt frames. He understood the peasant that lurked under the most sophisticated of Russian veneers and so gave these tales earth and grain and hovels dug into hillsides. He told of a great Mother who slept in such silence that even a spider’s weaving might be heard within it, and when that Mother awoke it was with torrents, twisting roots and smoking soil. During the writing of the Russian sections I began to drink my afternoon tea in the Russian fashion- with a dollop of vodka in it to ‘cheer it up’ and a bit of jam by the side, rather than sugar. There is nothing quite like drinking a delicate china mug of lavender tea, cheered with vodka, partnered with raspberry jam, while the snow drifts down outside your window and you dream of St. Petersburg in the 19th Century and Vladimir Vysotsky plays in the background, his voice like deep rich coffee spiked with- what else- vodka. I fell in love with Russian poets- Ahkmatova, Blok, Pushkin, Pasternak, and the one that I still read regularly- Joseph Brodsky. (I daydreamed about taking his classes at Columbia in which occasionally his good friend, Mikhail Baryshnikov, appeared). You can’t read about Russia without encountering tragedy of a sort that both takes your breath away and boggles your mind. To this day the numbers that died under Stalin are unknown, estimates range anywhere from a few million to 25 million. But those are numbers, it is when you read the personal accounts that it hits home- like the story I read of Misha, who after his mother and father were taken in the night by Stalin’s secret police, walked some 1700 kilometres across some of the most unforgiving terrain known to man, to find his sister. When he arrived at his sister’s door she turned him away, afraid that she would be tarred with the same brush her mother and father had been. Twelve years old, likely near to starving, Misha turned and walked back into the night and out of the pages of history. He haunts me to this day. And then as it was wont to do in Russia, winter came once again.The cold was so severe that breathing hurt and talk was unthinkable. Words would surely freeze and fall to the ground before ever making the journey to another’s ears. He had heard tell that the natives believed that each winter all laughter, tears, words and stories fell to the ground and froze, only to be awakened by spring’s thaw, when suddenly the air would fill with chatter, laughter, gossip and tragedy, a cacophony of humanity borne on spring’s gentler air. But what this ground would have to say was likely more than any human could bear to hear. For in what tone did blood and grief speak? Fragments and tendrils of the people who had once walked here, lived here, died here were left behind. You could feel their ghosts walk in step with yours, like a shadow that you could not detach from yourself, until the time came when you wondered if you were seeing through your own eyes or viewing a vanished world through theirs. To be here was to live in a place apart, to feel as though you inhabited a planet out at the very limits of the solar system, where the sun’s warmth could not be felt and there was no home other than this. 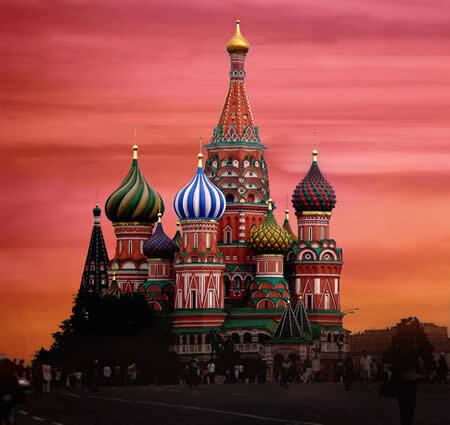 There wasn’t any aspect of Russia that didn’t fascinate me, that doesn’t fascinate me. To this day I follow the blog of an intrepid Ukrainian female motorcyclist who regularly biked through the strange and haunted wastes of Chernobyl. Her pictures of those wastelands, became a sort of metaphor, for what Russia once was, but is no longer. The incredible re-growth of plant life there, the return of animals that many thought were extinct, seems a metaphor too, of the Firebird that is so prevalent in Russian folk lore, of a country that will rise again, become something new, but something that is still, at its core, Russian- indomitable, mysterious, hardy, alluring and eternal. If you listened long enough in the great silences such a land held, it would speak to you—of its past, of its future and of all that had sundered it. Russia speaks to him of the great horsemen that once swept her plains, and the armies that even now marched by the hundreds of thousands across her frozen heart. She tells of falling stars that laid waste to the abundance of her bounty and the rifts in her body where enormous stores of water, the largest in the world, are held. She speaks of her peasants, her shamans, her priests, her emperors and queens, her poets and musicians. She whispers of the long iron girders that trace her spine for the distance of seven days. She speaks of the empty spaces in her soul, of the migration of dancing cranes and herds of reindeer. She speaks of her amber hair—seductively, her pearls, her minerals and the rich, loamy fertility of her plains. She tells him the story of all her peoples: the haughty, mysterious Slavs; the silent Sibers; the earthy Ukraines; the Balts and Turks and Tatars; and the Yakuts, whom she claims can walk through hordes of white men like smoke and never be seen nor felt. She tells of the thunder of foreign troops who have come again and again, and of the vast silence of her winters that have inevitably defeated her foes. Her voice is as dark as a terrible perfume, as she tells of the secret police and the fields sown with the blood of the forgotten innocents. She speaks in contradiction and secret languages that have not been spoken in hundreds of years. And under all her words, her seduction, her coldness, her heat and succor, he hears her heart—the great, thundering heart of Mother Russia. And he hears that it is a heart forever in the process of breaking.